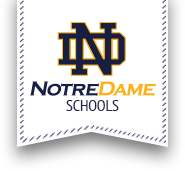 Visit with friends at the Notre Dame/UCA/DeSales Alumni Association Hospitality Suite in the library of Notre Dame Jr/Sr High School during the Juggler Classic Tournament. The hospitality suite will offer complimentary snacks and beverages to alumni. To RSVP for the event, please call the Office of Development & Alumni Relations at 315-724-5118 ext. 35 or email kpuleo@syrdiocese.org.